Prizes: Aimpoint PRO Patrol Rifle Opti and 5.11 Tactical ThumbDrive Thigh Rig. Prizes: Otis Law Enforcement Elite Cleaning System and 5.11 Tactical ThumbDrive Thigh Rig. Prize: Otis Law Enforcement Deluxe Cleaning System and 5.11 Tactical ThumbDrive Thigh Rig. 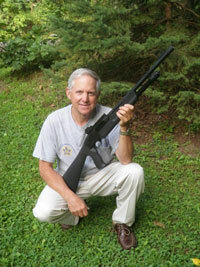 I was one of the recent FOP shotgun sweepstakes winners. Used it today and what a beauty! Smooth, accurate and low recoil with all loads, from bird shot to 00 buck to slugs. It’s definitely a keeper and [I] will share [it with] those I instruct. Hi, The television did arrive and everything is great with it. This thing is HUGE! Not sure it will it in my small house, but we shall see. I was thrilled to find out that I had won the television. Definitely a very nice gift! Thank you very much! Could you please express my appreciation to FOPConnect and the Grand Lodge. I am very appreciative and thrilled! Click here to enter the current sweepstakes.